Human Rights Watch says at least 91 women have been raped over the past four days in Cairo's Tahrir Square, a central site of recent mass protests that have shaken the country's political leadership. Protesters take part in a protest demanding that Egyptian President Mohammed Morsi resign at Tahrir Square in Cairo on July 1, 2013. The New York-based rights group reported on its website Wednesday that the attacks were perpetrated by "mobs" in the square, and called on Egyptian authorities to address what it called a "climate of impunity" in the Middle East country when it comes to cases of sexual violence. The string of alleged attacks "highlight the failure of the government and all political parties to face up to the violence that women in Egypt experience on a daily basis in public spaces," Joe Stork, the group's Middle East director, said in a statement. "These are serious crimes that are holding women back from participating fully in the public life of Egypt at a critical point in the country’s development." Human Rights Watch cited numbers from Operation Anti-Sexual Harassment/Assault, an Egyptian group, which it said had confirmed 46 attacks on June 30, an additional 17 attacks on July 1, and 23 attacks on July 2. A second Egyptian group, Nazra for Feminist Studies, reported another five attacks on June 28. The United Nations has also called attention to the sexual violence perpetrated during Egypt's mass protests. On Monday, a spokesperson for UN Secretary-General Ban Ki-moon issued a statement following reports of protesters being killed, injured, or sexually assaulted. "Though it would seem the vast majority of those taking part in protests have done so peacefully to this point, the reports of a number of deaths and injuries, of sexual assault against women demonstrators, as well as acts of destruction of property are to be strongly condemned," the statement said. 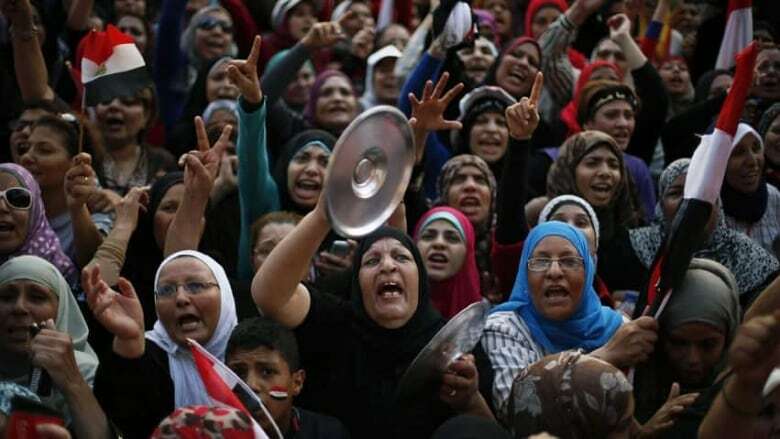 The targeting of women at political demonstrations has been a recurring problem in Egypt. One of the most high profile cases occurred two years ago, when a mob attack on CBS News correspondent Lara Logan in Tahrir Square made international headlines. The American TV network said Logan was the victim of "a brutal and sustained sexual assault and beating" but was eventually saved by a group of women and an estimated 20 Egyptian soldiers. Initiatives to counter the problem have mushroomed in recent months, with groups protecting women at large protests or during national holidays when groping and harassment in crowds is at an all-time high. Activists have offered self-defence classes for women. Social network sites have been started where women can "name and shame" their harassers.